In the year 1913 Canberra was born as our national capital on the very eve – as we now know – of the destruction that would be wrought by world war, that after five long years saw in Australia the desolation of the national spirit, the nation’s joie de vivre and its high reputation in the world as an advanced, progressive, independent-minded democracy. After 1913 never glad morning again. For the next year, in 1914, the new Commonwealth of Australia would become ensnared in an imperial war fought many thousands of miles away in the Old World of Europe and the Middle East, as the Austro-Hungarian, British, German, Ottoman and Russian empires, together with the Republic of France, became entangled in a cataclysm that would cost millions of lives. Australians joined the British imperial force, which included New Zealanders and Indians as well as French allies, in the attempted conquest of the Ottoman Empire in April 1915. Historian David Fromkin has documented the context and consequences of this foray into the Middle East in his acclaimed book A Peace to End all Peace: The Fall of the Ottoman Empire and the Creation of the Middle East. He reports British Prime Minister Asquith’s view that ‘[f]ew things would give me greater pleasure than to see the Turkish Empire finally disappear from Europe, and Constantinople become Russian (which I think is its proper destiny) or if that is impossible neutralised…’ Oddly, this decision by British and French forces, including colonials, to invade the Ottoman Empire to enable Czarist Russia to occupy Constantinople has been translated in Australian history lessons as ‘Australians fighting for freedom’. By July 1915, Higgins was lamenting the ‘12,000 casualties’ among ‘Australian lads’ at the Dardanelles. ‘We are living under a great shadow’, he wrote to Frankfurter, ‘our own son – our only child – is on the fighting line; and I live every day in fear of receiving a telegram about him’. Higgins hoped that one consequence of ‘the wastage of this war’ would be that the ‘world centre of gravity’ would shift to the United States. When Mervyn was killed in battle on 23 December 1916 Higgins and his wife were devastated. Higgins poured his grief – and his bitterness over the imperial cant that had justified the war – into verse. For us, in age, a childless home – and tears. How charming is divine philosophy! The cross, the mound of sand shew where they be. The only good that might come out of the war was not national pride, but a new spirit of internationalism. ‘Vengeance is a fruitless thing’, he wrote to Frankfurter. ‘I feel that the best vengeance my dead boy could hope for would be an integrated world, an organized humanity.’ No nationalist flag-waving or eulogies to the Anzac spirit for him. Rather, Higgins became a keen student of the anti-nationalist writings of Indian Nobel prize winner, Rabindranath Tagore (in 1913 the first Asian writer to win the Nobel Prize for literature) and he accepted appointment as President of the local branch of the world disarmament movement. We tend to forget that there was doubt about and opposition to Australia’s participation in World War I – from its outbreak in 1914 through 1915, when the Sisterhood of International Peace was founded, and then in response to the divisive conscription campaigns and strikes of 1916 and 1917 and the bitter recriminations that poisoned the years that followed – but the opposition and disillusionment have largely gone unheeded in official accounts of the war, which have recast it as a creative experience, one that gave ‘birth to the nation’, conveniently forgetting that our distinctive Commonwealth of Australia made its name on the world stage in the years before the war, between 1901 and 1914. And of all our far-sighted nation-builders, all the men and women including Edmund Barton, Alfred Deakin, HB Higgins, Catherine Spence, Vida Goldstein and Rose Scott, none needed experience of war to think creatively. The Commonwealth of Australia was born in peacetime and some international observers thought that this augured well for the position of women in the nation. And so it seemed until 1914. A decade before the outbreak of the European war, in 1904, an American visitor to Australia, Victor Clark, one of a number of investigators who journeyed south to Australasia, noted that ‘New Zealand and Australia are the most interesting legislative experiment stations in the world and they experiment so actively because their political institutions are extremely democratic’. The then colony of Victoria had first invented the idea of a legal minimum wage in 1896. This was elaborated as a living wage, calculated to meet the capacious needs of workers defined as human beings, in the Commonwealth Conciliation and Arbitration Court by the noble HB Higgins in the Harvester Judgment of 1907. Australia and New Zealand had pioneered industrial democracy and women’s political rights. ‘While the principles of democracy were first enunciated in the United States’, noted the historically-minded American suffragist, Carrie Chapman Catt, ‘Australia has carried them furthest to their logical conclusion’. Thus did we take our place on the world stage. In Australia, it was noted in overseas newspapers, the working man and the voting woman advanced together, during the first decade of the nation’s existence, seeing a steady increase in the Labor vote, until the Fisher Government was elected in 1910. By war’s end, however, the Labor Party had split, conservative forces had triumphed, the British Empire had gained a new lease of life in Australia, imperial servicemen were settled on Australian land and another Labor government would not be elected until 1929, on the eve of the Great Depression. Australian women, able to vote and stand for election to the national parliament from 1902, would not be elected to it until 1943. In World War 1 Australia lost its way. Its enmeshment in the European imperial war fractured the nation’s soul. He has certainly expressed, at greater length and with greater clearness than has anyone else, the ideals which have animated the Australian people and the Australian lawmakers in placing on the statute books the body of social legislation which has drawn the eyes of all the world to Australasia, and which marks the most notable experiment yet made in social democracy. By 1920, however, the conservative backlash unleashed by the impact of World War I and the fevered imperialism of Prime Minister WM Hughes saw Higgins submit his resignation from his beloved court. It would seem appropriate to remember Higgins, the Australian idealist, and others of his generation, as we commemorate the centenary of the national capital in this year of 2013 and as we prepare to deal with the veritable tidal wave of military commemoration, funded already by $140 million, even as our universities face further funding cuts and the number of historians employed in them declines. In this context it is all the more appropriate that we should commemorate those like Higgins – who fought for Australia’s distinctive civic and political ideals – and seek to carry these ideals forward. My current research project on the international history of Australian democracy has highlighted Australia’s high reputation in the world before World War I as a distinctive, pioneering, brave, independent-minded democracy. Distance lends a clarity to our vision, as the late Christopher Koch noted of the blue hills in his final novel Lost Voices. ‘Distance and only distance is where they have their being: distance makes them into visions.’ It was the perspective afforded by distance that enabled Professor Hammond to see ‘the most notable experiment yet made in social democracy’, born in Australia in the years preceding the war. Distance better enables us to see that vision, too. One aspect of my research project is a study of eight leading Australian and women whose idealism took them to progressive America: Charles Pearson, AI Clark, Alfred Deakin, HB Higgins, Catherine Spence, Vida Goldstein, Alice Henry and Miles Franklin. In 1902, in the shadow of the South African War, Higgins wrote an essay called ‘Australian ideals’ in which he asked whether the new Commonwealth of Australia was to become a militaristic nation or a progressive one. ‘Australia must make her choice between two ideals – the ideal of militarism and the ideal of equality’, he wrote prophetically. Australians had to choose between the opposing standards of militarism and social reform, he suggested, as he and his generation dedicated themselves to the latter. World War I proved doubly distressing for Higgins. After losing his only child he was assailed by a wild and, as he thought, vindictive Prime Minister. ‘The war has upset many of our complacent theories’, he told Frankfurter, ‘and I think much of my boy’. Under pressure of relentless recruiting, unemployment, price rises and two attempts on the part of the English-born Prime Minister Hughes to impose conscription, the country was riven by bitter class, religious, gender and political divisions. The war opened up new divisions between those who enlisted and the ‘stay-at-homes’, who were shamed by white feathers and social ostracism. The division between those who went to war and those who stayed at home would be perpetuated after the war in the new privileges and status accorded returned soldiers, many of whom, however, were also bitterly disillusioned and joined the anti-war movement. Higgins’s continuing clashes with Hughes over the jurisdiction of the Arbitration Court, in a context of escalating industrial militancy and conservative backlash, culminated in his resignation from the Court. His friend Frankfurter expressed his sorrow at Higgins’s decision, assuring him that ‘the great work you have done establishing traditions and a body of experience will survive’. Higgins was doubtful that this would happen: ‘Hughes is ruining our Australian experiments’. One hundred years on, Australia has seemingly become the militarist nation Higgins warned about in his essay ‘Australian ideals’. 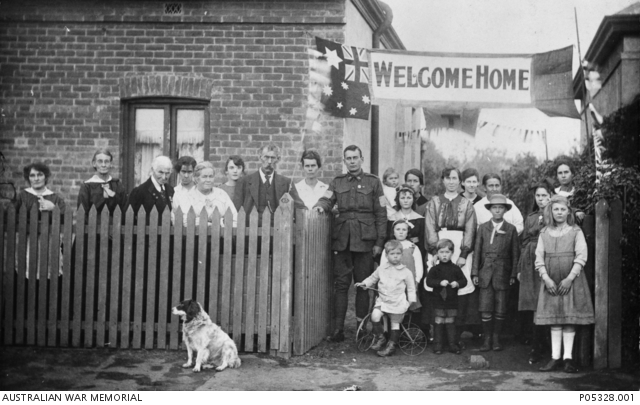 Rather than celebrate the world-first democratic achievements forged by women and men in the founding years of our nationhood, the years that made Australia distinctive and renowned, we are told that World War I, in which Australians fought for the British Empire, was the supreme creative event for the nation. On 18 September 2013, Dr Brendan Nelson, the Director of the Australian War Memorial, explained what we should know about the Australian experience of World War I. ‘It’s important’, he said, ‘that we tell the story of who we were in 1914. Why did we join the war so readily? And what happened in Australia domestically through the course of that war? And how did we change, emerging from it, as we did, so damaged but proud in 1918?’ This is a worthy investigation; in pursuing it, let us separate mythology from history. it seems to me that Australia, which took a wonderful lurch ahead in all progressive laws and women’s advancement about 20 years ago has stagnated ever since. At present it is more unintelligently conservative and conventional than England and I am sad to see the kangaroo and his fellow marsupials and all the glories of our forests disappearing to make room for a mediocre repetition of Europe. Marilyn Lake is Professor in History at the University of Melbourne. This is a revised version of a keynote address presented to the Annual Conference of the History Teachers’ Association of Australia, National Library of Australia, Canberra, 23 April 2013. For more on Higgins, see here.